Attorney George C. Miller Jr. attended Saint Vincent College in Latrobe, Pennsylvania. While at Saint Vincent, Attorney Miller was an active member of the Mock Trial Team, earning positions as Vice President and Team Captain. Attorney Miller won numerous awards for his skills as an advocate. Attorney Miller then attended Ave Maria School of Law on an academic scholarship. At Ave Maria, Attorney Miller continued to emphasize his litigation skills. As Vice President for the Moot Court Program, Attorney Miller travelled the country -- Florida, Atlanta, Chicago, and Washington D.C. -- receiving awards and national recognition for his abilities. Upon graduating, Attorney Miller was selected by the Dean of the Law School, from among every member of his graduating class, to receive an award for achievements in the field of advocacy. After passing multiple bar exams, Attorney Miller served as law clerk to the Honorable Joseph M. George, Jr. of the Fayette County Court of Common Pleas. Attorney Miller then accepted a position as law clerk to the Honorable Harry F. Smail, Jr. of the Westmoreland County Court of Common Pleas, where he spent nearly two years, before undertaking full time private practice. 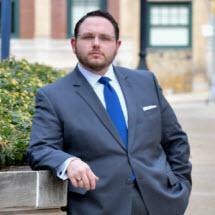 Attorney Miller also acts as a Professor of Trial Advocacy and Evidence, as well as Environmental Law, in the pre-law program at Saint Vincent College and co-coaches the Mock Trial Team. Whatever your problem, Attorney Miller stands ready to work hard for you.